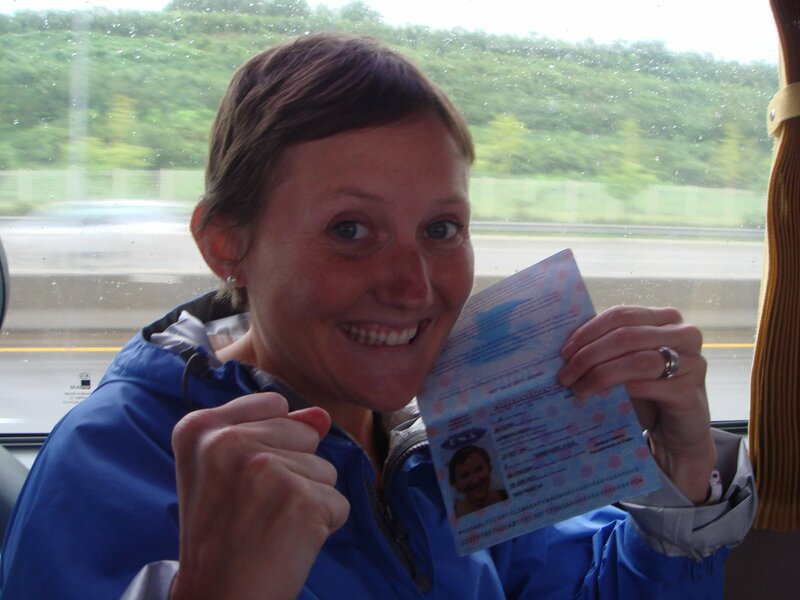 After Lindsay bereted me for forgetting my shoes to a running race last week, she promptly lost her passport upon entering a foreign country. When we finally got to our guesthouse last night we took inventory of our important documents. Unfortunately, Lindsay’s passport was MIA. So here we were in a foreign country unable to completely enjoy it because we weren’t sure if we were going to be able to go to Thailand on Thursday. I was supportive, but in the back of my mind I was think “HAH! This trumps anytime I ever lost my keys or my shoes!” But Lindsay was clearly close to tears. We had to return to the visitor’s center to retrieve the guidebook Lindsay left there and our hopes were that it was within its pages. It wasn’t. However, the two Korean women at the center went out of their way to help us. They called the Airport (no passport), the Airport bus station lost and found (no passport). They gave these places the number to our guesthouse and wished us luck. They truly empathized with us, telling Lindsay over and over how sorry they were. We tossed and turned last night, partly because of the laughter at the bar next door and partly because we were beginning to see our Thailand trip slip out of our fingers. We woke up early this morning, checked with the police station and struggled with how we were going to catch the correct bus to the airport. Instead, we caught a cab. After struggling to communicate with the cab driver (who thinks we were on our way to Taiwan) we finally made it back to Incheon airport. We walked to the info desk around the arrival exit. I noticed an American passport on the desk, but refused to believe it was Lindsay’s. It was. After our celebration at the desk, we didn’t know what to do with ourselves, but I will say the rainy day has failed to keep our spirits down. All we have been able to think about is Lindsay’s dumb luck coming through again. But the best thing about it is now I look like the responsible one. Previous Post We are here!!! I’ve conquered North America and am now coming for you in South Korea, although to be honest, the Korea’s aren’t on the board game Risk…but I’ll be in the general vicinity. You can wave.